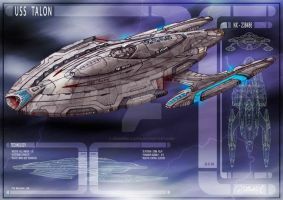 The USS Plaustrum. The Roman word for a horse drawn carriage. 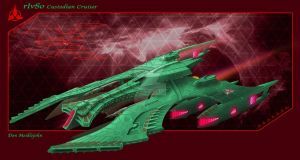 And updated design from an old sketch of mine - the USS Outrider. 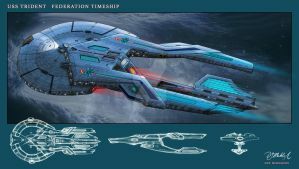 This ship is designed to be the first on the scene hence her class name 'Response Class'. 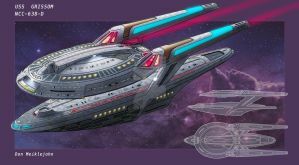 A more efficient use of warp design where the nacelles pull the vessel through space instead of pushing the ship. 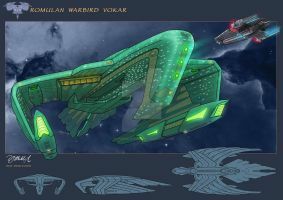 A Weapons Pod can be mounted on the struts located behind the main bridge or for large engagements the lower nacelles can be removed and replaced with various pod configurations. The warp core is located in the Saucer forward of the Main Bridge (indicated by 3 hatches). 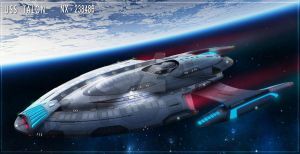 No Saucer separation is available in the USS Plaustrum but the Main bridge is ejectable. 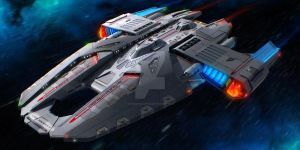 Slightly smaller to her cousin the Sovereign class starship but just as powerful with fore and aft quantum torpedo launchers and ablative generators. 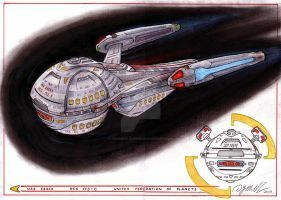 While i like that ship quite a lot the way the nacelle pylons 'bite' into the saucers rim 'against the flow' of the saucer is a bit of a negative eyecatcher. Minor cosmetic irritation. 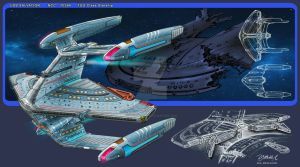 Probably one of the most interesting Trek layouts for a Fed ship that I've seen in a long time. 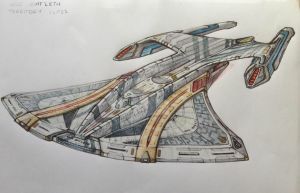 Now THAT is a very creative starfleet design! The heavy forward section with trailing engineering hull is absolutely stunning to look at! Cool and definitely "different", in a good way.